If you frequent several online slot sites you’re bound to come across the Joker Jester slot from NextGen Gaming before too long. If you like the look of a slot game chock-full of shockingly-bright colours, this is definitely a good one to try. But it’s got more to offer than a bright game screen. 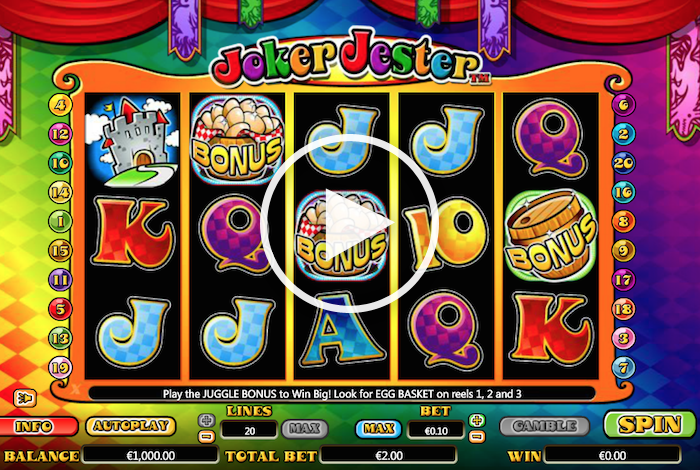 The Joker Jester slot is a NextGen Gaming presentation with a standard 5 x 3 layout and 20 paylines. With references to jokers and jesters in the title alone, you may not be too surprised to find the game is based on royal entertainment of yesteryear. It’s an unusual theme – not something we’ve seen before, if memory serves – so will it join the best of NextGen’s offerings thus far? The jester in times gone by was someone hired to entertain royalty. In some cases, failing to do this meant more than just the end of their career. It probably meant the end of their life too. But let’s put that grisly fact aside and accept that the jolly nature of this game is easy to understand once you realise how hard that jester has to work! We’re easier to please than royalty, which is probably why we rather liked the game. The extra features may be different from what you’d expect, but a change is as good as a rest, are we right? This is a 2D game unafraid of garish colours. It does fit with the theme though, and you do get a basic animation of the wild jester when he helps you win a prize. The controls are a little more challenging to get used to than you might have seen in other games. However, just click on the cog in the top right corner and you’ll instantly be able to adjust your lines and coin values too. This actually works well because it leaves the rest of the screen free to make the most of the design. Mind you, if you get annoyed by bright colours and a garish design, that might be a negative point! The payout table is accessed by clicking the ‘i’ once you open up the cog mentioned above. 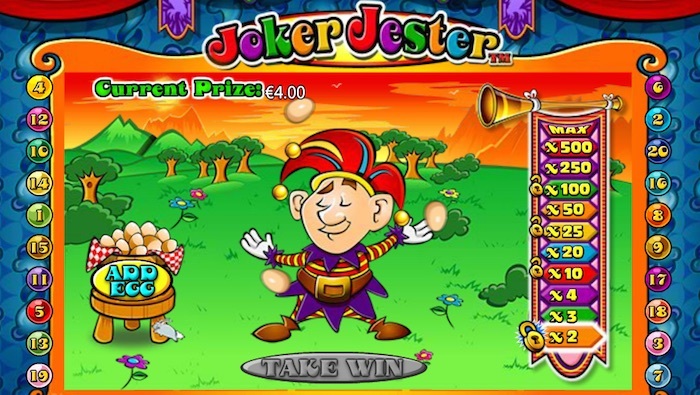 The Joker Jester slot has the usual wild (the jester) and scatter (juggling balls) present. Other than that, the only unique symbols are the lyre and the castle. The other ones are of the usual K, Q and A variety you’ll have seen before. All the info in the paytable appears on a single page. Just scroll down within the screen to read it all. For a game to become one of the most popular slots for UK players, it has to offer a nice array of solid features. There are two bonus features – neither of which involve getting any free spins. So what is on offer? Well, NextGen’s Joker Jester has a bonus basket of eggs that can appear on reels one, two and three. When this happens on all three reels simultaneously, you enter the Juggle Bonus feature. The jester will begin by juggling three eggs. You then click on ‘add egg’ to throw another one into the mix. The idea is to get him juggling as many as possible to get a bigger prize. Golden eggs are the best ones to find, and there are safety levels scattered throughout at which you can lock your prize on that particular level. The second bonus is the Barrel Bonus, achieved by getting the barrel on reels three, four and five at once. Choose barrels to get prizes and avoid picking the jester for as long as possible, as this ends the round. Finally, there is a Jester Wild feature too. This happens at random after any regular spin. The jester will appear and turn some of the symbols on the reels into wilds. This can end up triggering more prizes for you. Penny slot players will like the minimum line bid of a penny a go. With 20 lines in play, 20p will get you a spin to try and win on them all. The maximum coin value is £2, so the top bet works out at £40. That’s a fair bit lower than some other games go for, but it still allows for some bigger-valued prizes if that’s the way you want to go. The biggest basic prize is 500 coins for getting five jesters packed together on one line. However, the various bonus features could potentially allow for a bigger prize than that if the luck is firmly on your side. The return-to-player (RTP) rate for the NextGen Gaming Joker Jester online slot is given in the paytable as 95.974%. The Joker Jester slot doesn’t appear in 3D, it doesn’t have free spins and it doesn’t have the most modern of looks, either. But even with all that in mind, we still liked it. There’s something cheeky about it that put a smile on our face. Make no mistake – we wouldn’t play it for an extended period of time, but it’s good enough to warrant a go to see whether there are any nice prizes in the offing.